Skyblader Carbon Boomerangs - Carbon Fiber / Plastic Composite Boomerang. For ages over 13. The Skyblader Carbon Fiber Boomerang is constructed of a carbon fiber and plastic composite material which makes it harder to break. It's 4 wing design and precise molding gives you consistent airfoils every time. 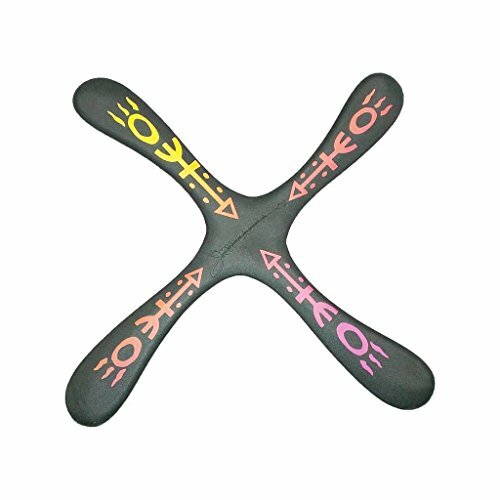 This is one of the best boomerangs available anywhere in the world. As it is a Carbon Fiber boomerang it is a little heavy and not recommended for children. Black for great visibility in the air and on the ground! Lift the tips up for even more returnability! 4 blade design for precision throwing! Aussie Fever Wooden Boomerang - Decorated Australian Boomerangs, Made in Australia! Glow in the Dark Bumblebee Boomerang - Easy Returning Boomerangs! Left Handed Red Bumblebee Boomerang - Easy Returning Boomerangs. Great for kids and adults. Aspen Fire Wooden Boomerangs - Great for kids 8-18! Wildfire Boomerang - Tri Blade Fast Catch Sport Boomerangs from Colorado Boomerangs.